A few weeks ago, from across a crowded Goodwill, my eyes locked on a beautiful chair. In disbelief, I noticed the $3.99 price tag. This chair's fate was sealed and I brought her home. When my husband came home from work, I proudly showed off my new chair and he responded, 'oh, you bought a chair'. He obviously was not impressed. 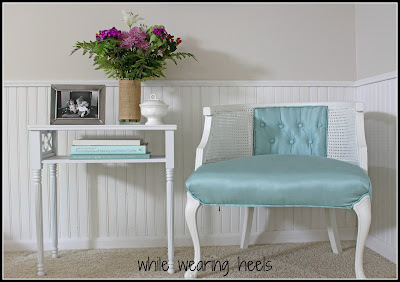 A coat of white furniture paint, some new Tiffany blue fabric and a few weeks later, there is no denying her beauty now. 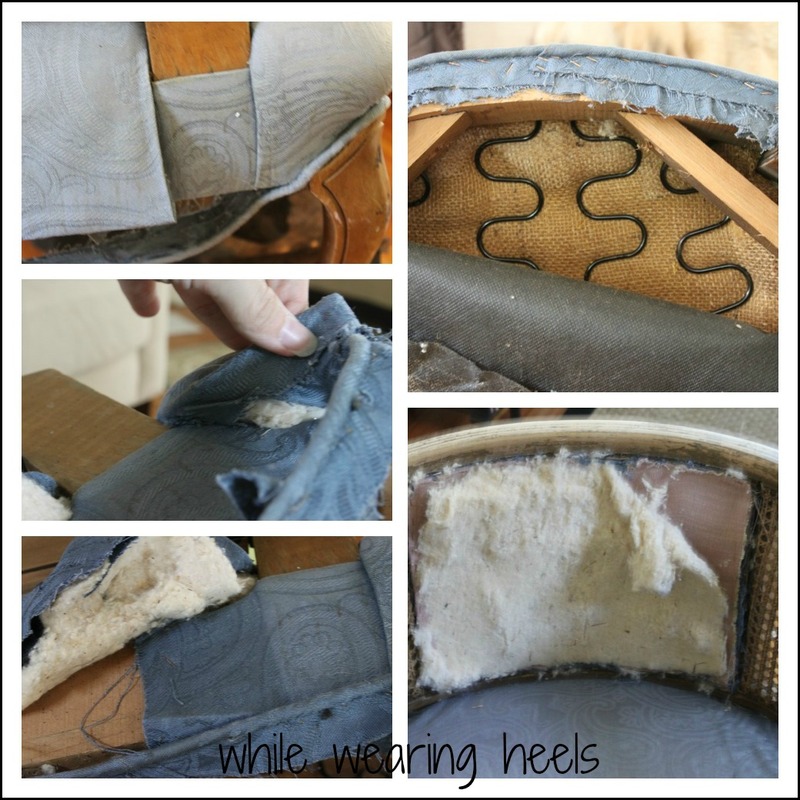 I put my piping skills to the test and learned a lot of lessons along the way. Lessons learned from a first time reupholstering project. 1. 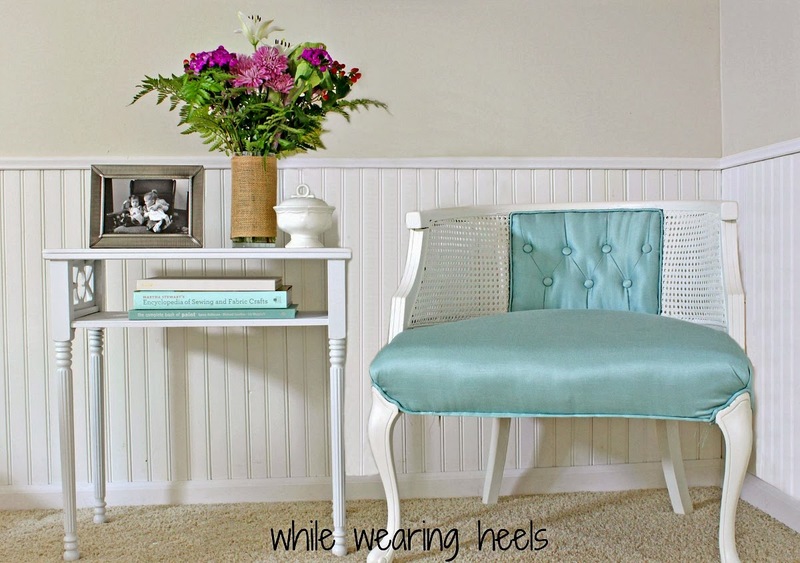 Take lots of pictures as you disassemble your piece of furniture. When the time comes to reupholster your piece, the pictures can act as a guide to reminding you where things had been before. 2. 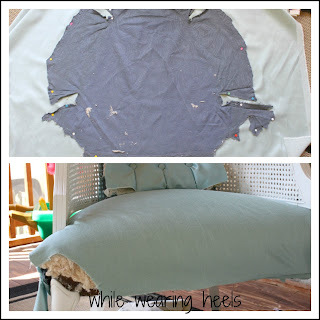 Keep the fabric you remove intact and in one piece. This will provide a pattern for cutting the replacement material. 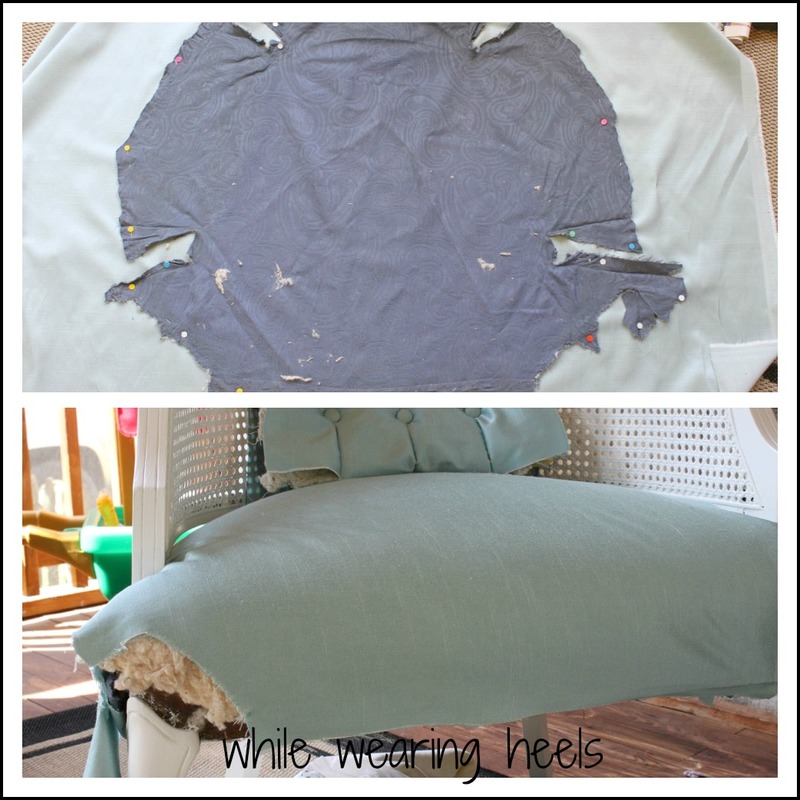 *The old fabric may have been cut or trimmed after it was stapled into place SO when cutting out your new material do not cut to the exact size of the piece you removed, cut the new piece bigger than the old piece. *I learned this lesson the hard way. 3. A normal staple gun will not attach the fabric as securely as needed. 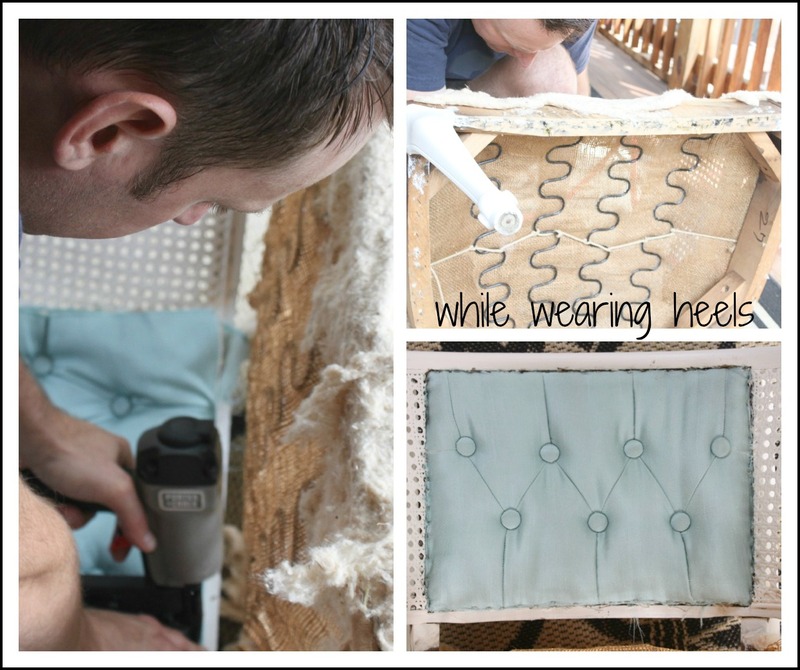 An electric staple gun provides the power necessary to securely attach the fabric to the chair. 4. Some husbands and wives craft together peacefully and cohesively. Should a fight break out between you and your husband, who you have convinced to help you with the electric staple gun, enjoy the guilt flowers that will follow. Amy, you are sooo talented. I absolutely love the color of the fabric you chose. http://www.hometalk.com/ ummm, I wasn't paid to mention them, lol! Marvelous job Amy! That chair had no idea of the beautiness that was coming it's way once it ended up in your capable hands! Yay for the flowers too! That turned out beautifully Amy! 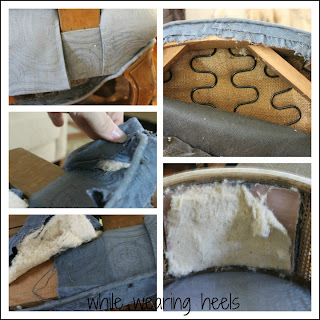 And thanks for all the tips - my reupholster project is still in the disassembling stage! I love it! That's the exact reaction my husband would have had, "you brought home more thrifted furniture? Yay.". You did a nice job and got a great deal on it. And you even got flowers out of it! Your new chair is gorgeous! I LOVE the colors.You did a fantastic job! Beautiful job!! Love the colors. Wow! I love how this turned out. Nice piping! And how nice that you work things out together. Hopefully, your sweet hubby appreciates your thrifty-ness and good taste! Your chair turned out AMAZING! Thanks for the practical and funny tips! this is stunning!! thanks for the post!! It looks wonderful! You did a great job! 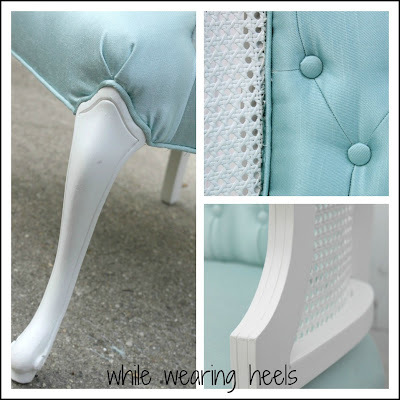 I love the color and the piping is fabulous! It is so beautiful!! I love it!! And kuddos on the big reveal pictures! They are as beautiful as the chair itself!! Amy, What an amazing score, and your transformation is fabulous! Love the color you chose...it looks so pretty with the white table and matching blue books. Oh my! You did such a fantastic job! It looks absolutely gorgeous! I can't believe the transformation. You did an amazing job, and thanks so much for the useful info. I'm sure it'll come in handy for me one day. Once again...Amazing! That looks great! I would have walked right by that chair, but you saw it's potential! She is exquisite. I love one of a kind pieces of furniture and have to say your piping detail looks excellent. I am inspired to head to Goodwill soon! I smiled so much while reading this. The flowers (HA!) the extra yard of fabric (hehehe). And the outcome is insane. I can't believe you did the tufting!!!!!! Very pretty. Thanks for sharing this project. Absolutely gorgeous! You have serious skills!!! I love love the color. wow...its beautiful!!! i LOVE it...great job!! What a wonderful transformation. The color combination is so beautiful. It really gives the chair a new life! I love how it turned out! 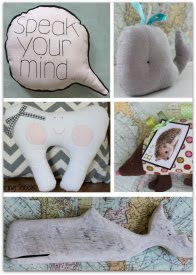 Congrats on crafting with your husband. hugs to you darling Amy, can just see you sitting in your gorgeous new chair! a craft fight - hahaha - i have had a few of those too! love the chair so very much! and those "i'm sorry flowers", great touch! I have always wanted to redo a chair but I am too chicken to try. You did an amazing job, I love love love that chair! The chair turned out great. I'm impressed with your piping skills, and did anyone have to go to the ER to have electric staple gun staples removed from their torso or was the abuse only verbal? Your Chair turned out fantastic! Love the colors you picked! That is definitely an amazing transformation and I can't believe the price you paid. Pricing is so crazy at thrift stores sometimes. I just found your link on The Winthrop Chronicles and I'm now following your blog. Wow! Just found your site via ATG. This chair was definitely inspirational for me. I am about to undertake my first redo. Thankfully, I have signed up for a re-up class via the local community college where I will learn the basics and how to do piping. The tufting and button work are very impressive! This is soo cool! I can't believe the difference the white paint makes and the turqoise fabric! 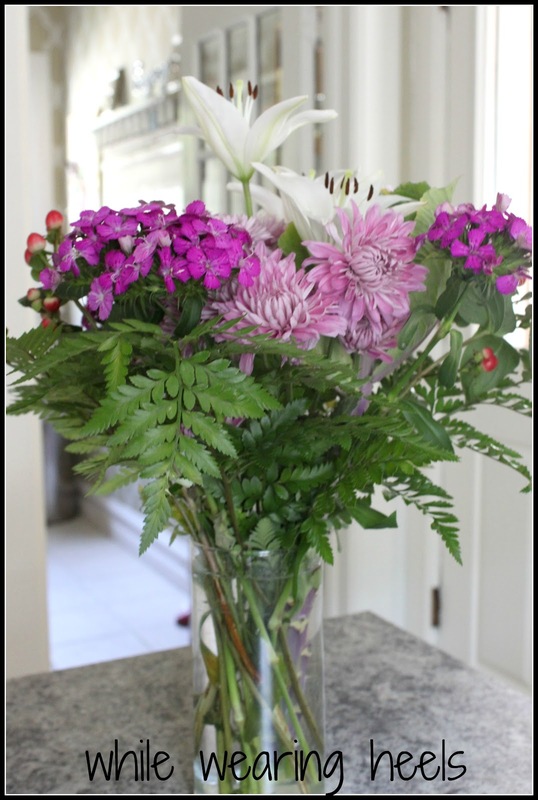 Come link up to Centerpiece Wednesday and share this with us and enter my giveaway! Amy this is absolutely beautiful. I was wondering how it would turn out and this is gorgeous. Love the "I'm sorry" flowers. I love what you did to this chair. I have a link party on Wednesdays, and I would love it if you would link this and any other posts. It is called Wednesdays Adorned From Above Link Party. It runs from Wednesday to Sundays. This chair is beautiful! Such a unique shape! 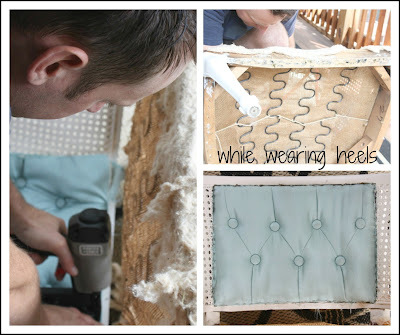 Love the makeover and the tips for reupholstering! That is amazing! You and your hubby are so very handy ... even if a fight ensues and sorry flowers are needed ... in the end it looks fantastic! Haha! This post made me giggle - way to make the hubby pay, girl! :) That chair is GORgeous, btw! Such a cool transformation! Thanks for sharing!!! Your chair is so cute, I LOVE the fabric you chose! I can't believe that's the same chair! AMAZING! I love it, that Tiffany blue fabric is just perfect! And I sometimes make my husband help me with stuff around the house, but I never get flowers after if we argue about something! Beautiful chair! You did an awesome job! Wow, Amy, it looks so posh now! It's hard to imagine it being anything but how it is now. Oh and I think that little table by it's side is also super darling! I think my bf and I would also not be able to craft patiently together, not that he'd take any interest in it... but that's ok I always got my dad (who is not patient either...) ;) I made the same mistake as you when reupholstering our kitchen chairs, good thing my dad caught me after I had only cut 2 out of the 4, so we still had enough fabric to remedy the situation. 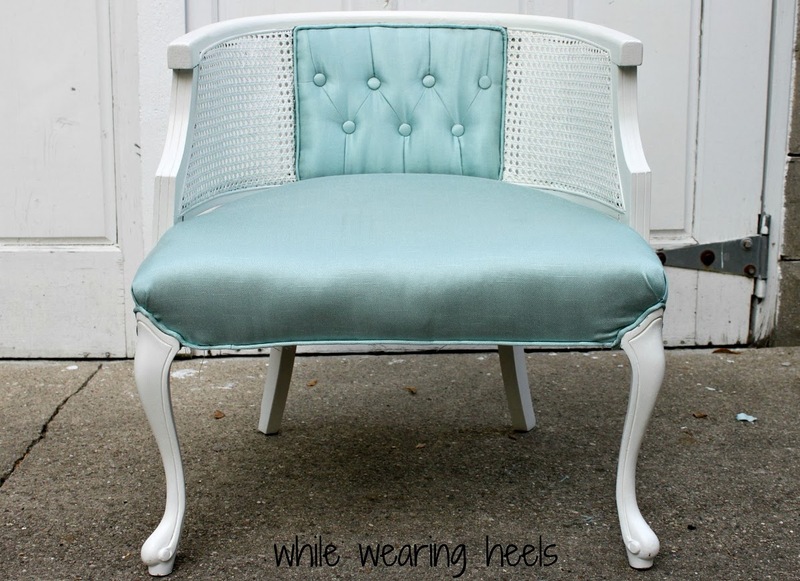 I LOVE the makeover of this chair! It is so cute!! Thank you so much for sharing at Thursday's Temptation. Your post got the most views this past week so I am featuring it at the link party!! What a freaking awesome chair! this is an amazing find, and is such a great statement piece! I'm uber impressed. 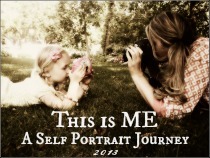 I'm new to the blogosphere! Well, he sure knows how to pick pretty flowers. They are gorgeous with the chair. And oh my goodness, that fabric is a dream. You did an amazing job on that chair. The tufting looks so complicated. What a project to take on, it's no wonder a fight broke out. It's the tough ones that are really worth it though. Congratulations! I am always seeing these chairs in thrift stores. Never thought they could look so nice. You've inspired me. Your chair looks fantastic. Nice job. It came out beautiful!! Thank you for sharing on Sharing Saturday!! This is fabulous! I had to laugh -- you are SO right about taking pictures as you go and keeping everything intact to make patterns! I reupholstered a hide-a-bed sofa a few years ago; the back alone had 13 pieces, but I didn't have to deal with welting. And when the arguments started over the staple gun (apparently, I need to grow bigger hands...), I didn't get make-up flowers. LOVE your color choices, BTW! I'm off to Goodwill! What a wonderful comment. Thank you SO much for appreciating my chair and my challenges in working with both staple guns and my husband :). I hope you find something great at Goodwill. Thank you so much for your incredibly sweet comment. I love that you can relate to how difficult co-crafting can be with a spouse :). I love this chair would you be interested in selling it? This chair is awesome!! and 3.99 that is a steal!! I love what you did with this chair! Absolutely gorgeous! I love that colour too, beautiful. Thanks so much Shell. I was in complete disbelief when I saw the $3.99 tag. Though, to be honest, I go to Goodwill so often, I am bound to run into good deals now and again. Thank you so much for your sweet comment. 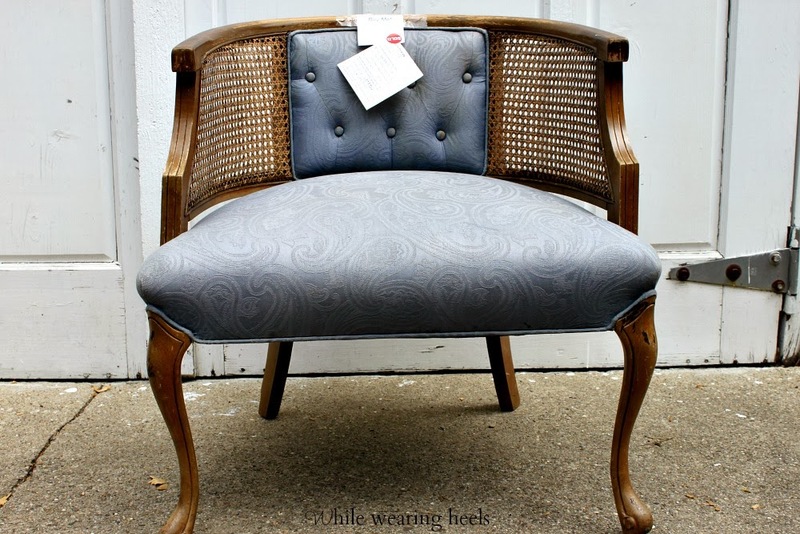 What a lovely chair redo! I've never reupholstered anything, but you have inspired me to give it a try!